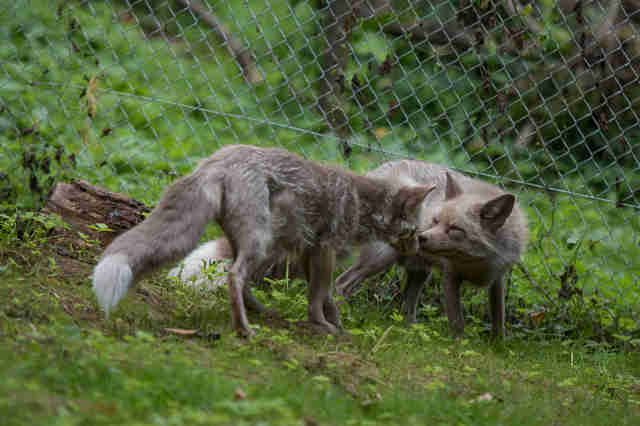 "We planned to slowly introduce the foxes but found them cuddled together through a fence separating their enclosures." 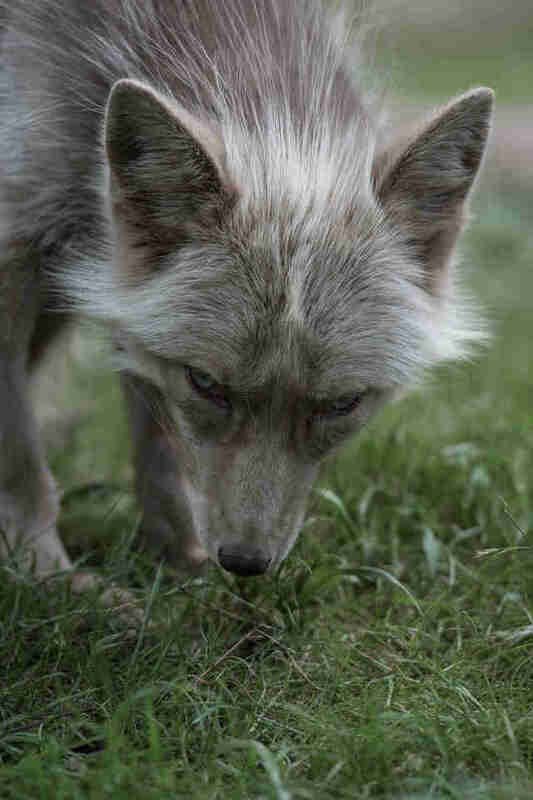 It's nothing short of a miracle that Zoe, a fox with gorgeous silvery fur, made it out of a fur farm alive. 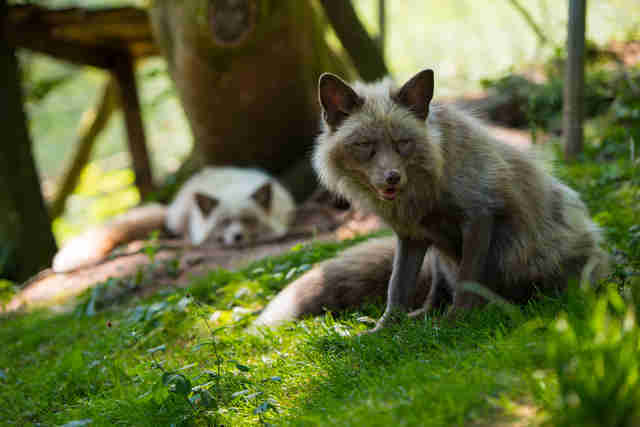 Zoe is a "pastel fox," the result of cross-breeding between a platinum fox and a white-faced fox to create fur with that silver sheen, something that never would have occurred in the wild. 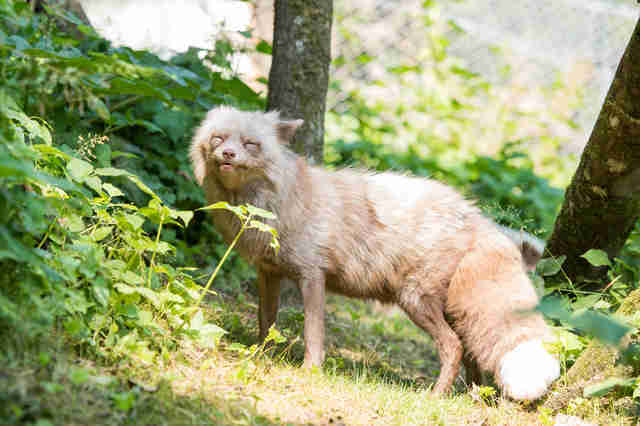 Zoe faced a life of misery and an early death at the fur farm in the Netherlands where her life began — but, in 2012, she had a stroke of luck. Zoe was rescued when she was just about a year old and brought to Tierart, a sanctuary in Germany chiefly for big cats run by Four Paws International. The sunlight and fresh, nutritious food was a far cry from what Zoe had experienced before. For years after her rescue, Zoe learned to love her new life in the sanctuary's natural environment, free from harm and fear. Then, in 2016, something quite unexpected happened in a town nearby — and it was about to shake up Zoe's world. Local residents spotted an unusual-looking animal wandering around their neighborhood. 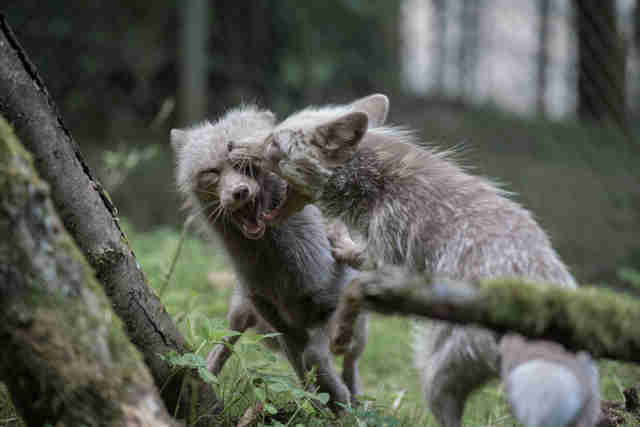 The animal kind of looked like a dog and had silvery brown fur that no one had ever seen before. The animal was trapped and brought to Tierart. And the animal wasn't a dog, either. 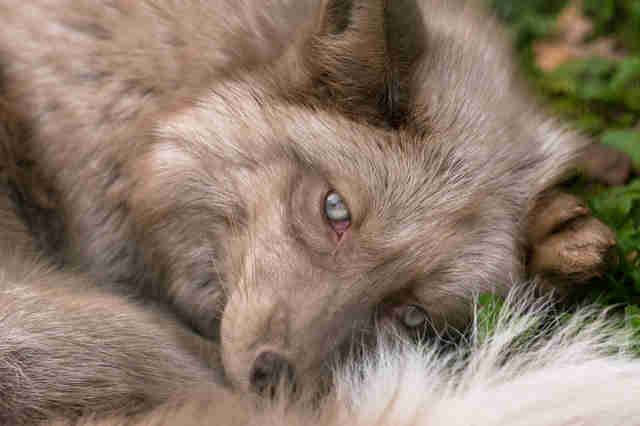 He was a fox, and not just any fox: He was a pastel fox just like Zoe. Rescuers named him Frodo. And Frodo was oddly friendly with people, giving his rescuers a hint about where he might have come from. “Since the coloring of a pastel fox is not found naturally in the wild and Frodo seemed to be used to people, the Tierart team suspected Frodo was kept as a pet and simply abandoned," Florian Eiserlo, site manager at Tierart, told The Dodo in a statement. 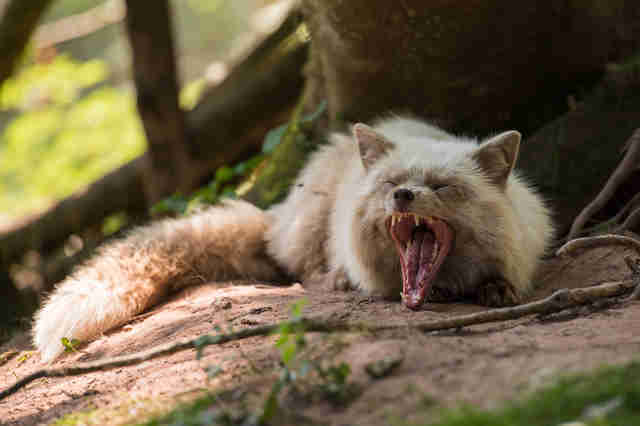 "Unfortunately, there are still breeders on the internet who advertise pastel foxes as exotic pets ... We were happy to offer him a forever home." 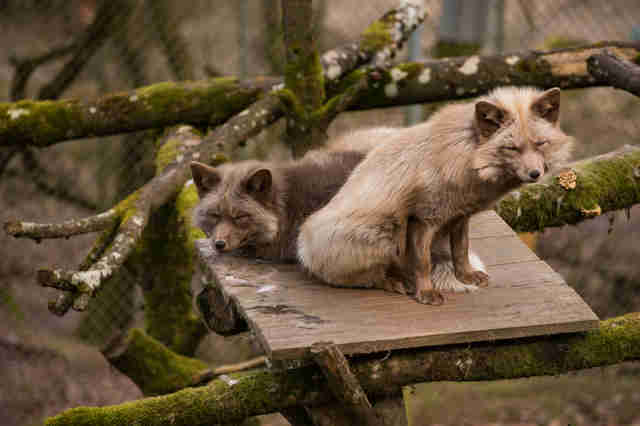 That two of these rare captive-bred foxes ended up at the same sanctuary almost felt like destiny — but because foxes are territorial, the people at the sanctuary didn't want to rush any kind of relationship between Frodo and Zoe. They put Frodo in an enclosure that shared a fence with Zoe's home. This way, the two foxes could very slowly get used to the sight and smell of the other. 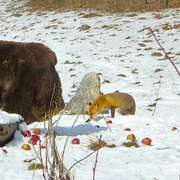 "We planned to slowly introduce the foxes," Four Paws wrote. "We found them cuddled together through a fence separating their enclosures." It only took one night for Zoe and Frodo to realize how much they wanted to be near each other. 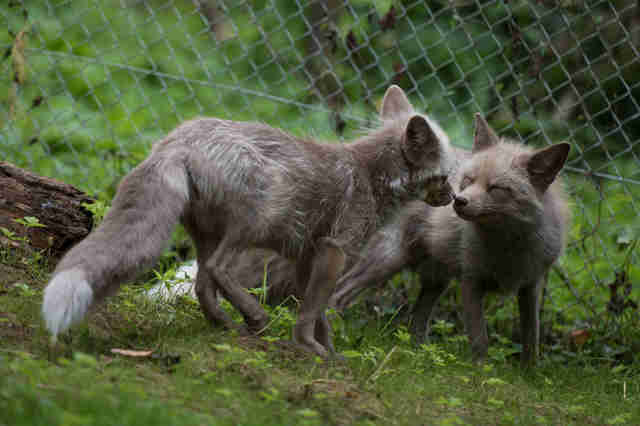 In the morning, staff members found the foxes each lying right next to the fence, as close to cuddling as they could come. Soon after that, Zoe and Frodo moved in together — and they've been inseparable ever since. 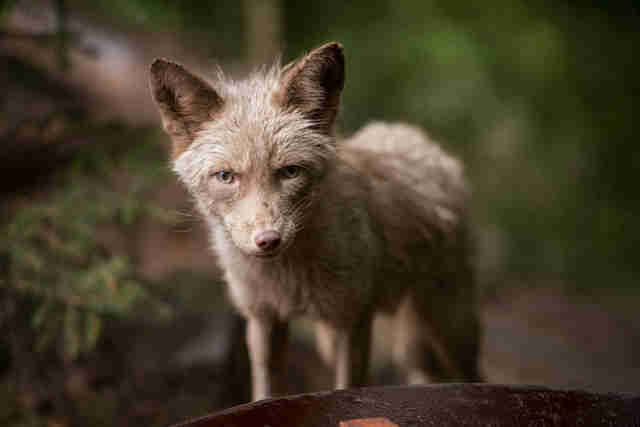 "What are the odds that Zoe, a fox initially brought to Tierart from another country, and Frodo, a fox that was kept by humans and later abandoned, would find one another?" Claire LaFrance, head of communications for Four Paws USA, said. Zoe and Frodo enjoy sunbathing together, playing together, cuddling together, exploring their newly expanded home together — they pretty much love anything as long as they can partake in it together. 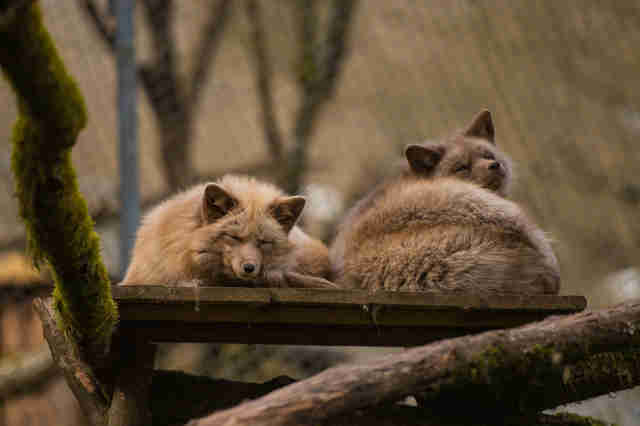 In captivity, foxes can live as long as 14 years. Because Zoe is 7 years old and Frodo is believed to be 4 years old, it looks like this happy couple has many joyful years ahead of them. “We hope these two will have a long and happy life together,” Eiserlo said. You can help Tierart care for this special couple by making a donation.